The Pioneer Stoves story begins back in the l970`s on a dairy farm in Southern Ontario. Two Amish brothers were trying to make a living from their partnership hand milking Holstein cows. The younger of the two, Mark Stoll, had just returned with his wife and young family after having spent ten years in the small Central American country of Honduras. Mark and his wife moved into the small tenant house on the farm. Being Amish, they of course had no electricity, phone, TV etc. Mark’s wife needed a cookstove for preparing food, and they also needed some way to heat the house. It did not seem reasonable to put two stoves into the small house, yet there was no stove available that would efficiently heat the house besides doing the cooking and baking. After much discussion, Elmo and Mark decided to design a heater/cookstove combination. They called this stove the Pioneer Maid. The Pioneer Maid was the first airtight cookstove ever built that utilized the efficient downdraft air intake. The Pioneer Maid instantly became a hit among the Amish people and soon word got around and the general public began buying it as well. Elmo and Mark called their newly formed company Suppertime Stoves. Suppertime Stoves is still alive and well today, being owned and operated by Mark and two of his son in law. Two of Elmo’s sons took their family’s share of the stove manufacturing business with them when they moved to the rugged backcountry of Caneyville, Kentucky to join the Caneyville Christian Community. At Caneyville, sharing a two hundred acre property with thirteen other families, they formed the little sister to Suppertime Stoves, Pioneer Stoves. Caneyville Christian Community is not, just another subdivision or housing development, nor is Pioneer Stoves a run or-·the mill manufacturing company. The fifteen families at Caneyville Christian Community live without most of the conveniences that the average American takes for granted. Electricity, computers, cell phones, cars and the like have been traded for the slower pace of horse and buggies, hand tools, and face to face communication. The Christian Community at Caneyville, besides having several families like Aaron and Solomon Stoll who were born and raised in a horse and buggy lifestyle, has attracted several families and individuals who are new to the “simple” life and it’s unique joys and challenges. Pioneer Stoves has come to play a pivotal role in the community’s attempt to provide work for its members. Pioneer Stoves is communally owned, and is being relied upon as a primary income source for those new to the community, and a secondary source for some who have lived here long enough to establish other sources of income such as vegetable farming and horseshoeing. You may be interested in the fact that not only is Pioneer Stoves being utilized as a force in lifestyle and social change, but our energy source is also non conventional. One hears phrases like “Green” and “Carbon Neutral” being tossed around these days. We don’t claim to be up on the latest wisdom concerning global warming and renewable energy, but here in our little secluded corner of the country we are quietly doing our part. The Pioneer Stoves manufacturing facility is powered by an antique steam engine. We feed the boiler with scraps from a local pallet remanufacturing plant. And of course, true to the legacy we inherited of making one stove multi task for us, we utilize the waste heat from our steam engine to heat the shop in the winter months. If you happen to be traveling by, drop in and visit us. We will be glad to show you not only our shop, but also our little community. You will find us enjoying each other’s company, living a life we are passionate about, and building a product we believe is a good thing to have built. Tested to UL standards, two-year warranty. 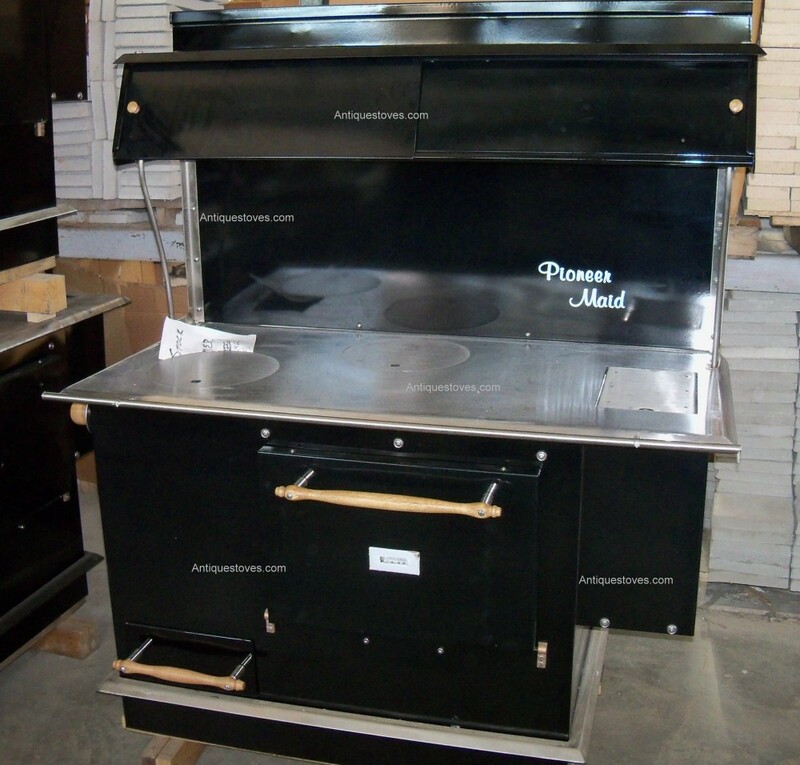 The Pioneer Maid is a top load stove, meaning an "eye" in the cook top is lifted to load wood in the firebox. 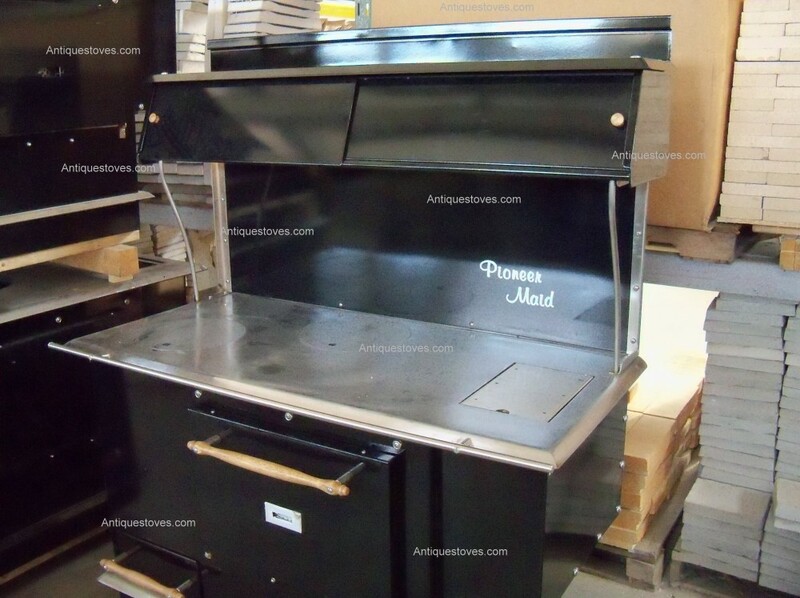 The Pioneer Maid oven not only heats quickly, holds and even heat for longer periods of time, and is easily controlled but has a capacity for 8 loaves of bread. The entire Pioneer Maid stove exterior is clad in baked-on porcelain for better looks and easier cleaning. The Pioneer Maid doubles as a space heater when the oven door is open, thus converting the oven into a ready-maid heat exchanger, unbelievably efficient. Will heat approximately 2,000 square feet. A high back and sturdy shelf provide convenient storage for the items you like to have handy when cooking and baking. An optional warming closet also available to keep food warm until mealtime. 10" x 10" length of stove. Almost 50% of the Pioneer Maid stove body itself (excluding the top) is made of stainless steel material that should never rust or corrode. Fingertip Control - The Pioneer Maid offers a degree of control undreamed of by grandmother. A simple twist of the twin air-intake knobs and the fire leaps to life. A twirl in the reverse direction and it is almost instantly dampened down. Large Firebox - The large size of the Pioneer Maid firebox permits stoking the fire for longer periods, as well as cutting down on the splitting of wood. Quality Lining - The refractory brick liner in the Pioneer Maid firebox is thicker and stronger, custom-molded to our specifications. Welded Construction - The Pioneer Maid is held together with welded steel throughout for a lifetime of trouble-free performance. High Back and Shelf - A high back and sturdy shelf provide convenient storage for the items you like to have handy when cooking or baking. 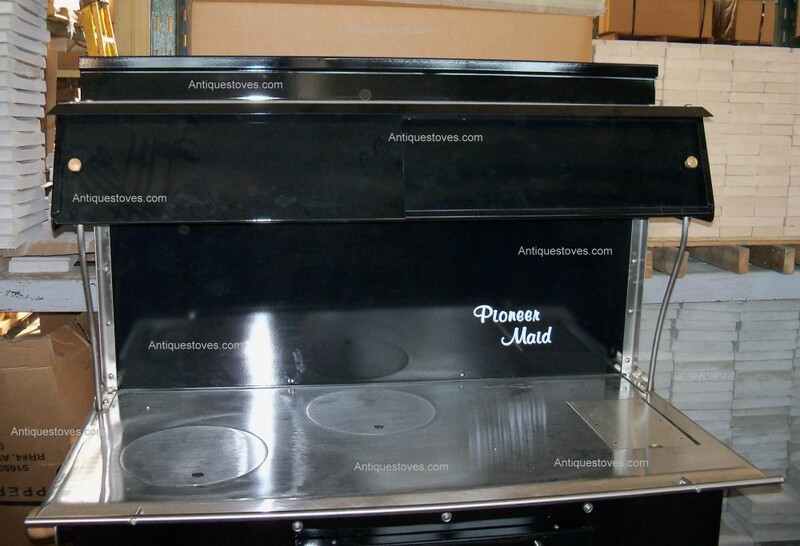 Standard Features - The Pioneer Maid offers many features such as an ash pan for easy cleaning, stay-cool wooden knobs and handles, black porcelain finish, spring-loaded oven door, oven thermometer, internal flue damper, and an optional hot water coil and a reservoir model (10 U.S. gallons). Length 18 ½ " 18 ½ "
Width 11 ½ " 11 ½ "
Depth 18 ½ " 18 ½ "
Flue Size Round 7" 7"
Weight 570 lb.. 623 lb..
Unit overall width 43" 52"
Unit overall height 51 1/2" 53 1/2"
Height to cooking surface 32 1/2 " 32 1/2 "
(double plate steel over reservoir) 22 1/2 x 41" 22 1/2 x 50"